OK, so let’s admit that shopping for the guys in our lives is a hard task. This year, let’s look beyond the typical ideas and explore a list of gifts that are just a cut above those personalized socks you got him last year. Thanks to the wonderful brands at The Fashion Mall at Keystone, we are blessed with a huge selection of items to choose from. Here, I have narrowed it down to 5 stores just for you. After all, who really has time to shop every single store in the mall? So, here you’ll find my personally curated selection from the C Wonder Store (yes, they have stuff for guys), Teavana, the Art of Shaving, Saks Fifth Avenue, and Day Furs. From Saks Fifth Avenue (Above): Why not pamper him with a new fragrance? Or give him a reason to enjoy longer luxurious showers? Or even update his winter wardrobe? From The Art of Shaving (Above): Definitely the ultimate pampering session, but also a thoughtful gift for the guy just starting out shaving. Plus they also have some great travel essentials. This kit is a great starter kit for men! Comes with everything they need to get the perfect shave. Additionally, Art of Shaving at the Fashion Mall at Keystone offers in-store barber services for men who are interested in a true straight razor shave. Gift cards are also encouraged! From Teavana (Above): What about some cozy gifts for the holidays, such as the ultimate tea set or a trendy travel mug? Great if your man is a tea-lover! This collection comes with several different flavors of tea, plus the tins to keep them fresh. From C Wonder (Above): Something fun for a fun-loving guy. If your man has a touch of quirky humor, then these ideas are perfect for him. From Day Furs (Above): The amazing “Hook and Albert” Weekender Garment bag. It’s a splurge gift, but if your guy is a frequent traveler then this bag is the perfect gift. Watch the video here and you’ll know if this is a must have right away! Hopefully with these ideas, you will find that choosing the perfect gift for the men in your life is easier this year. And knowing that you can find all of this at The Fashion Mall at Keystone, you can have it all accomplished in one stop! Have you been outside recently? You need a scarf. Like, really bad. Scarves are great because they’re basically a publicly acceptable way to wear a blanket around your neck. Just take a look at this wondrous thing Lenny Kravitz did two years ago. But if you aren’t as bold as Mr. Kravitz, then here are a few other options you might want to consider to protect that precious neck of yours this winter. This Double Cable-Knit Eternity Scarf from Urban Outfitters is a chunky and perfect way to keep warm. It comes in black, red, and grey… not to mention that it can double as a pillow for catnaps at your desk. If eternity/infinity scarves aren’t your thing, what is wrong with you? But whatever, you can still get this Marled Chunky Oblong Scarf from Urban Outfitters. Still chunky, perfect, and warm. Still able to use as a pillow. Just, you know… less infinite. In you’re in the market for something more seasonally appropriate and classic, I’m in love with this burgundy plaid Mosaic Wool Scarf from J.Crew. Festive, retro, and casual, all in one look. Seeking a neck so warm Dante’s Inferno would be jealous? This Bickley + Mitchell Scarf from Urban Outfitters has a cozy fleece lining that provides the ultimate winter protection. The Rail department at Nordstrom also has a variety of pieces perfect for any guy looking to up his scarf game. One of my favorites is this Geometric Knit Scarf with the fringed tips finish. Heading into the snowy season can be scary when you don’t have the right fashion game plan. It’s tempting to throw on sweats and hibernate forever, but no trendsetter ever gave up that easily. Your winter wardrobe can instantly become season-ready with a few of the right staples. No need to purchase all new everything; these cold weather basics are everything you need for endless fashion wins this winter. Keep your body warm underneath a big scarf. Naturally, basic, neutral colors are sensible and match everything, but don’t be afraid to use an infinity scarf as a pop of color! There’s no harm in bringing fun to the freeze, and the bigger the scarf, the bigger the smile. That’s what I say, anyway. If you don’t already own the perfect pair of booties, it’s time. Arguably the most timeless shoe that has lasted seasons without being drastically remade, it’s safe to say you can purchase a trusty pair and keep them for years. The perfect ankle boot will be comfortable yet easily worn no matter the occasion. “Cool girl” is in full force this season, meaning faux leather is all you need to look seriously fab. If you want to step it up even more, try a faux fur vest. You can keep your hair and makeup simple – the trick is not to try, and how can you say no to that? Function and fashion work well together when you know what you’re looking for. As the temps drop, oversized sweaters and knitted hats will be your best friend this season as you endlessly seek warmth. If you want to spruce up your cozy knits, pick a pretty statement necklace. Staying strong on the fashion front is the chambray phenomenon. Don’t get rid of your denim just yet – you can use your chambray for layering or mixed with army green pants. Add a pair of fun military boots and a scarf or necklace and you effortlessly evolve from day to night in a matter of seconds. Whether you prefer your leopard prints bold or subtle, there are endless ways to sport this speckled style. A leopard print scarf is a simple way to add dimension to any outfit, or throw on a pair of printed flats to keep your style fresh. No matter the garment, leopard print is the answer this season. Skirts become even more fun in the winter months! Invest in a few pairs of tights, socks, and all the fixings for fashion that’ll keep the freeze at bay. Plaid skirts are no longer just for school girls, in fact you’ll teach a lesson or two when you’re spotted in the cutest cold weather outfit around. Add a pretty peacoat and you’re ready to go! You can find these and many more must-haves for wall at the shops at Lenox Square and Phipps Plaza. And always remember to Live Life in Style! One of my obsessions this season has been the fringe trend. It’s just so hot right now and I love it. It’s a trend that will keep you going past the holidays and into the spring. From fringe bags to shoes, you can literally find a bit of fringe on almost anything these days. 1) Fringe Skirts – I’m all about going bold, so a fringe skirt with the extra long fringe like this one by Tamara Mellon has got my name written all over it. You can dress it up or down and turn heads everywhere you go. 2) Fringe Bags – To add fringe to your daily look, a bag is the way to go. Yes it’s a bit boho, but it’s just perfect for adding that effortless factor to your look. This drawstring bag by Antik Batik has the perfect fringe overload for you. 3) Fringe Accessories – You can find fringe accents on shoes, earrings, and necklaces. For just a hint of fringe, go for one of these options. This necklace by Rebecca Minkoff is perfect for day or evening. 4) Fringe Dresses – Of course you can go for fringe without it being a flapper dress. I love this chic fringe-bottom dress by Stella McCartney, which is perfect for your holiday party. 5) Fringe Jackets – Talking about going for bold, a fringe jacket is a great staple that never goes out of style. This jacket by ThePerfext is just stunning and totally worth the investment. Remember to keep following me on the Style Setter site for the latest finds and trends from The Galleria. If you feel like just controlling the kids over the holidays is enough of a feat, let alone dressing them well for all your festive engagements, then you can join the majority of tired, stressed, and overworked parents out there. My tip (as a non-parent, mind you) for getting the kids ready for the myriad of events this season, whether it be for school, a school activity, Church or family gatherings is to prepare in advance! If you make it a “special occasion outfit” with a few smart interchangeable pieces, then you will be set for all your upcoming events. If you keep the clothes as “special occasion only,” then the kids will hopefully get excited to wear their Sunday best! Recently I styled the outfits below for toddlers up to 4 years old for my Fashion Friday segment on WTHR. For those of you that missed it live, you can see the segment video here. These outfits are so fun and festive, yet warmth and comfort play such an important role in clothing this time of year. I don’t like to wear itchy or bulky outfits, so I can’t expect that kids would want to either. I love the Parisian inspired outfit above for a younger girl (around 18 months old) styled from Baby Gap. The cotton floral dress paired with warm red leggings, the navy blazer with bow detail, the ballet slippers, and the beret hat are all so feminine yet wearable. Your daughter would be happily playing all day in this sweet outfit. This outfit above from Gap Kids is so festive and fashionable! The added touch of sparkle would have any little girl feeling just like a winterland princess and the red peacoat with toggle clasps is a stylish and classic way to keep her warm. We all know how chilly it can get in the big open school halls or even at Midnight Mass on Christmas Eve. The big trend for boys right now is to look just like older siblings or even Dad. So the outfits I styled for the little guys in your family are almost like mini-me versions of bigger kid outfits. In the outfit above I’ve put together the festive patterned sweater with a shearling lined collar, paired with dark corduroy pants, brightened up by the chambray shirt half untucked for the “cool” factor, and finally the lace up boat shoes with leather accents. The outfit above is styled from Gap Kids for a 4 or 5 year old boy. He will feel so trendy with the dark denim and quilted jacket with a baseball cap to hide any messy hair days. The grey pullover is soft yet warm enough to wear on its own and the pop of red buffalo check pattern brightens up the outfit with the shirt and matching lining on the hiking boots. You’ll notice that everything for the boys is cuff-able, so you can buy a size up and get a full season of wear, despite any holiday growing! Take note of my shopping tips and be prepared. Get your outfits planned early this year! Head to the Fashion Mall at Keystone and check out GAP Kids and Baby GAP for the looks above. It’s almost that time of the year where we hunt through our local Simon Malls to pick and choose our favorite gifts for the special people in our lives. 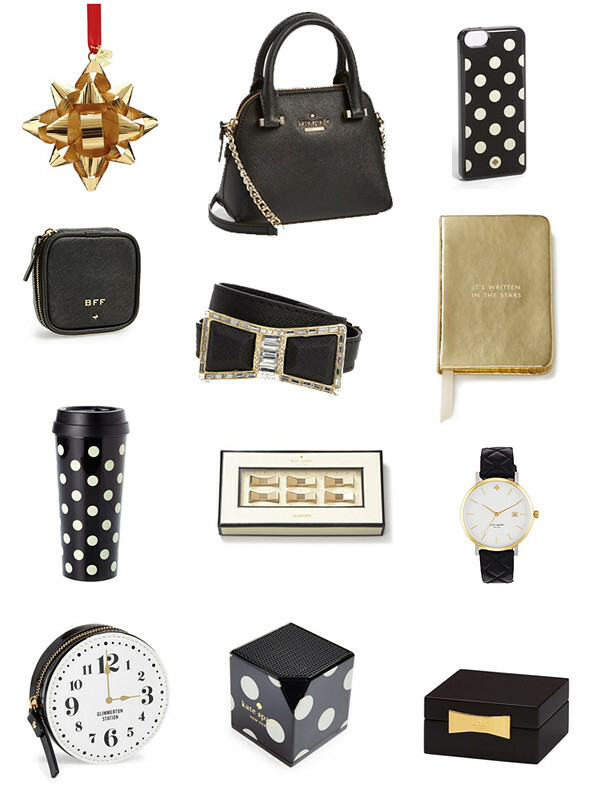 I was preparing myself for Black Friday, making gift lists and wish lists, when I stumbled upon an entire Kate Spade Accessories collection (available at the Shops at Mission Viejo and Brea Mall locations) that is perfect for any special lady, best friend or sister! And if you can’t find anything for them… then at least you can find something for yourself. Especially when each item is covered in black and white polka dots or adorned with a classic bow, it’s hard not to fall in love with it all. The Kate Spade collection has everything from bluetooth speakers, bow magnets, adorable notebooks, pretty ornaments and, of course, beautiful hand bags. So make your list and check it twice. This Friday, Nordstrom will have a wonderful Black Friday sale and you’ll find plenty of these items heavily discounted! So get ready to swing by your local Simon Mall and stock up on these beauties!